Thank you! And Happy Halloween! Are you using yfrog to upload photos from Sparkbooth? Check out the yfrog photo widget. You can use it to display the uploaded photos on your web page or blog. Next go to yfrog and create your yfrog widget which will generate an embed script. Copy this code and place on your web page or blog, and now you got Sparkbooth photos on your web site! 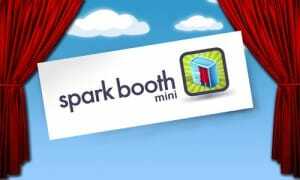 Sparkbooth Mini is now available in the Android Market. All the fun of Sparkbooth for your Android phone. Starting today, August 31th, 2010, Twitter is switching off basic authentication for third-party services. This means all the Twitter upload services in Sparkbooth 2.2.1 or lower will no longer work. If you want to continue to use any of these Twitter upload services, please download and install Sparkbooth 2.3 Beta. TwitrPix, Img.ly, MobyPicture, Posterous, TweetPhoto, TwitGoo, TwitPic, and yFrog have all been updated to use the new OAuth authentication method now required by Twitter. Unfortunately, ScreenTweet, TwitDoc, and TwitSnaps have not updated their services to use the new authentication method, so they have been removed from Sparkbooth for now until they have been updated.